As goods pass through the supply chain they face a number of threats. Whether that’s during transportation or in warehouses, from criminal activity or changing environments damaging delicate and perishable goods. With remote monitoring in place the whole supply chain can benefit from optimised security, ensuring goods arrive when they are supposed to and without damage – minimising disruption to business. What is remote monitoring and how can it improve logistics security? Remote monitoring is a cost-effective business security service. At a remote monitoring station, like the Farsight Observatory, trained and highly-skilled security professionals monitor alarms from sites 24/7, 365 days a year. When an alarm is raised at a site, they will immediately investigate the cause. If suspicious activity is identified they will call the client, keyholders and relevant emergency services. As a result, security systems such as CCTV become instrumental in stopping incidents as they happen, as oppose to footage only being used for evidential purposes – once the damage has been done. The security measures a warehouse requires will be dependent on the goods it stores, its location and the access individuals require. As an example, a warehouse could contain a particularly precious cargo stored in one specific area. That area could be cordoned off with lasers, that are activated at all times unless someone with permission enters a code or is visually verified by Farsight. If those lasers are broken at any time, an alarm can be raised and sent to Farsight. 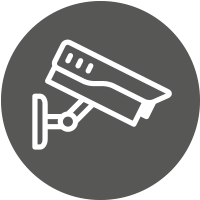 Farsight’s remote monitoring services can also provide security whilst goods are being transported in the UK. With GPS devices fitted in vehicles, Farsight can monitor the journey of goods – checking for unauthorised stops and any suspicious activity. For many products and goods, the environment in which they’re stored is crucial. Perhaps lighting, temperature or humidity need to be at a certain level, or the risk of flooding would be catastrophic. The Farsight remote monitoring station is able to monitor and control conditions at warehouses and storage units to ensure the environment is optimum for the goods being stored. Why choose Farsight Security Services for logistics security? With Farsight Security Services your logistics and supply chain security will benefit from remote monitoring from a market-leader that sets standards beyond the industry average. Dedicated to innovation, Farsight will always strive to provide cutting-edge services that keep your security optimised when you need it most. Get in touch with Farsight today to find out more about how we could improve supply chain security. Call us on 0845 371 0101 or send us an email. Get in touch with us today to find out how Farsight Security Services could improve your logistics and supply chain security. Phone us on 0845 371 0101 or send us an email.